I don’t sew, but I’m the daughter of a talented sewist, so I chose to review this book in part so I could pass it on to her. I’m glad I did, because the story was fantastically crafted, both Jeanne and Peggy (and less so Thelma and Tommie) have stitched their way into my heart. Practical Jeanne and ambitious, dreaming Peggy struck me as being both perfectly complementary sisters – each balancing the other – but also as representing the duality of all of us who are creative, and must constantly decide whether to let our business sense or our romanticism take the lead. I found their relationship reminiscent of my mother’s relationship with her own sisters, though I really only see that in glimpses. Beyond just their sisterhood, though, I found the journeys each woman takes to be quite compelling. I like that each woman ends up more self-aware at the end of the book than they were at the start. Each of them is stronger and more confident in who they are and what they truly want in life. In addition to the actual story, I really loved the way the book was designed. Yes, there’s that fantastic Dior-inspired dress on the cover of the book, but inside, each section is linked to a kind of fabric, beginning with taffeta. (I remember my mother cursing over certain kinds of fabrics when I was a kid, and I’ve called her to find her doing the same thing much more recently. 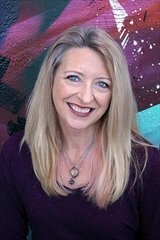 Author Sofia Grant has put a lot detail – historical, sewing, family, setting – into this book, and her care shows. The book never feels affected. Rather, it seems effortless, a sure sign of a great deal of work. You don’t have to sew, or have a relative who sews to appreciate this book. The period setting, the family relationships – those are what make the novel. The rest? That’s window dressing. Really, really good window dressing. Goes well with a Philly cheese-steak sandwich. Not because it has anything to do with the novel, aside from the fact that much of it is set there, but because I really want one. 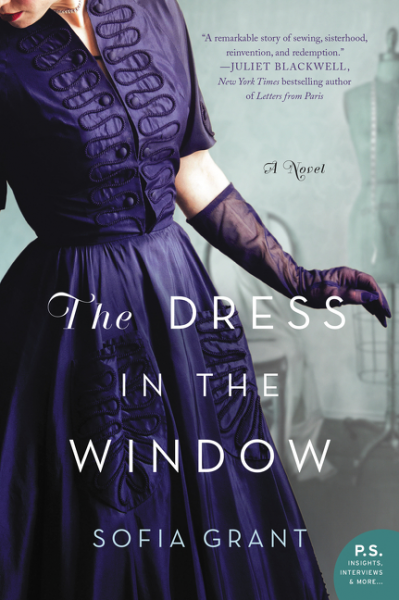 Review: The Dress in the Window, by Sofia Grant by Melissa Bartell is licensed under a Creative Commons Attribution-NonCommercial-ShareAlike 4.0 International License.